Indicative of the steep slump in their form, India drew a blank at the ICC Awards for 2006 that saw world champions Australia steal most of the honours, with captain Ricky Ponting claiming two awards, including the most prestigious Best Player of the Year award, at a glittering function here today. On a day of mediocre hockey, defending champions Punjab and Sind Bank made short work of Delhi to maintain their hold over the coveted Rangaswamy Cup, while the Indian Oil Corporation snuffed out the Namdharis’ challenge to win the bronze medal in the 62nd National Hockey Championship at the Olympian Surjit Hockey Stadium here today. Members of the Punjab and Sind Bank team hold the Rangaswa- my Cup, which they retained after beating Delhi in the final of the 62nd National Hockey Championship at the Olympian Surjit Hockey Stadium in Jalandhar on Friday. Holders West Indies rode on the sheer brilliance of centurion Chris Gayle to pull off a six-wicket win over South Africa and march into the final of the Champions Trophy cricket tournament here last night. 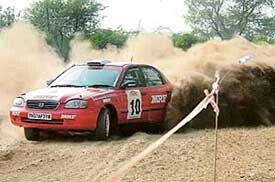 Local star and current leader Karandeep Singh of Team MRF didn’t have an ideal start to his campaign in the Power Pine Forest Rally 2006, the fifth round of the Indian National Rally Championship, finishing the 2 km super special stage in fourth position at the Kala Gram grounds here today. A participant competes in the Power Pine Forest Rally at Kala Gram in Chandigarh on Friday. The controversial Members Participation Agreement (MPA) and the Oval Test fiasco were among the major issues which came up for discussion on the opening day of the ICC Executive Board meeting here today. Dope-tainted paceman Mohammad Asif would appeal to get his one-year ban revoked or at least reduced, so that he can play in the World Cup in the Caribbean next year. Australia will seek to use their experience to quickly adapt to the slow pitch at the Brabourne stadium when they take on title holders West Indies in the final of the Champions Trophy, promising batsman Michael Clarke said today. Substitute Y. P. Wang helped China sail through to the quarterfinals of the AFC Youth Championship beating Thailand 1-0 in their last Group B league match today. Indian hopes were dashed in the Denmark Open badminton championship as Chetan Anand and Nikhil Kanetkar went down tamely to higher ranked rivals in the pre-quarterfinals here. Jeev Milkha Singh flew on the wings of two eagles and five birdies to reach the top of the leaderboard in the Yomiuri Memorial tournament here on the Japan Golf Tour. The fifth Santa Singh Bhaur Memorial Open Football Tournament will be held at Government Senior Secondary School for Boys, Phagwara, from November 9 to 12. The BCCI has appointed two former Punjab and Haryana Ranji Trophy players, Monish Aggarwal and Sarkar Talwar, as selectors to select the North Zone team for the Vizzy Trophy inter-zonal matches as per the communication received by them from Mr M. P. Pandove, Joint Secretary, BCCI. YPS, Mohali, and Daly College, Indore, earning 8 points and 6 points, respectively, in Pool B while Pinegrove School, Dharampur (8 points) and YPS, Patiala (6 points) from pool A ensured themselves a semifinals berth in the 9th Sub-Junior Public School hockey Tournament for boys underway at Pinegrove School, Dharampur. Ponting won the Garfield Sobers’ Trophy presented to the best cricketer, besides bagging the Best Test Player of the Year award. 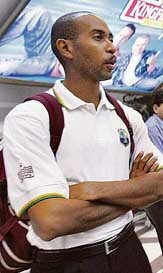 Indian skipper Rahul Dravid was in the running for the Captain of the Year honour, while Yuvraj Singh had been nominated for the One-Day International Player of the Year award, but they lost to Sri Lanka’s Mahela Jayawardene and Australian middle-order batsman Michael Hussey, a late bloomer on the international circuit, respectively. The ICC’s annual awards night was expectedly dominated by the Australians, who captured five of the 10 awards on offer, with Simon Taufel winning the Umpire of the Year award and Karen Rolton bagging the newly introduced Woman Player of the Year award. Dravid, however, got a consolation “prize” by being named the captain of the ICC’s Dream Test team, a selection of star performers from various countries. But the team did not include any other Indian cricketer, although the ODI Team of the Year, with Jayawardene named to lead it, had in its ranks three Indian players — Mahendra Singh Dhoni, Yuvraj Singh and Irfan Pathan. Dravid expressed his disappointment at the team's recent stumble but said the upcoming tour of South Africa afforded it a great chance to get things back on track. “It feels great to be back here, accepting an ICC Award. It’s the second time I have got into this team and it is a huge honour and privilege. I think to lead this time would be a pretty easy job you would just have to throw the ball to someone and they would do the rest,” the Indian skipper said. “We had some very good results for a while and we have stumbled since then a little so the upcoming tour to South Africa will be a great opportunity to get things back on track for India. “I am a little disappointed that we are not in the final of the ICC Champions Trophy — it would have been great to be feeling nervous ahead of that final on Sunday,” he said. West Indian captain Brian Lara gave away the Emerging Player of the Year award to England batsman Ian Bell, who beat back the challenge from compatriots Alistair Cook and Monty Panesar, apart from dope-tainted banned Pakistan pacer Mohammad Asif. Ponting praised his team members for lifting themselves up after having a hard inward look after losing the Ashes series to England last year. “The past 12 months have been very satisfying to me as the captain of the team. Some of the teams work I did and some of the runs I made were for my team-mates. We enjoy each other’s successes. I am really thrilled to be recognised by the present captains, players and past players through this award. “The Ashes was long gone and it was important for us to move on, to lift ourselves. We had to show our courage at the first opportunity. We all looked back at ourselves and managed to play some good cricket,” he said. Jayawardene also lauded his team members on getting the Captain of the Year award. “The award is not for myself but for the entire team. I don’t believe that a captain can do well without the team’s contribution. A captain is only as good as the team. It’s a triumph for teamwork over the last six-odd months,” he said. Rahul Dravid (captain), Matthew Hayden, Mike Hussey, Ricky Ponting, Mohammad Yousuf, Kumar Sangakkara (wicketkeeper), Andrew Flintoff, Shane Warne, Makhaya Ntini, Muttiah Muralitharan, Glenn McGrath. 12th man: Brett Lee. Mahela Jayawardene (captain), Adam Gilchrist, Mahendra Singh Dhoni, Ricky Ponting, Yuvraj Singh, Mike Hussey, Andrew Flintoff, Irfan Pathan, Brett Lee, Shane Bond, Muttiah Muralitharan. 12th man: Andrew Symonds. Leading 2-0 at the breather, Punjab and Sind Bank conceded a goal in the second half to end with a comfortable 3-1 win in the title clash. 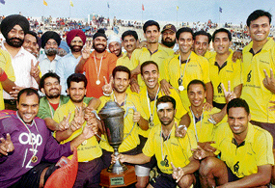 It was virtually an all-bank final as the Delhi team was comprised of players from Punjab National Bank. Expectations of some vintage hockey on the concluding day of the tournament were dashed by the IOC boys in the bronze-medal game as they went on a scoring spree to end up with a flattering 7-2 win. Intriguingly, none of the finalists — PSB or Delhi — have any of their players in the national camp for the Doha Asian Games to be held next month. For Delhi, like most of the participating teams, it turned out to be a memorable national championship as they made it to the final for the first time since Partition. In their previous three appearances in the final in the 1940s, they won the title once (1942) and lost the title clash in 1940 and 1946. For PSB, it was their second successive national title. Though the quality of hockey expected of an event of the stature of the national championship was missing in most of the games of the super league, it was the organisational part which came in for admiration. “Not even a single umpiring decision was reversed throughout the championship,” remarked Kuku Walia, technical delegate of the tournament. Also, the final turned out to be memorable for Kuku Walia’s deputy, Charanjit Singh Raheja, who is not only the secretary of the PSB team but also the secretary of the Delhi Hockey Association. So both finalists were primarily his teams. PSB’s superiority was never in doubt right from the hit- off as it had the young Delhi team on the defensive. It may be a mere coincidence that most of the players on view in the final came from Punjab. Sadly, this once nursery of Indian hockey did not even qualify for the semifinals even on its home turf. PSB opened their account with a brilliant goal by their winger Rajwinder Singh, who after intercepting a sitter from Mandeep Singh, banged the ball home from a comfortable position on the top of the striking circle. Once the lead had been secured in the 17th minute, it did not take the holders long to consolidate it. Five minutes later, it was centre forward Parminder Singh who did not let go a measured free hit sent to him by halfback Sandeep Singh from near the 25-yard line. His powerful grounder from the top of the circle had the goaltender Jasbir Singh of Delhi stranded yards away from the ball. After changing ends, PSB survived some anxious moments in the beginning of the second half before Parminder scored yet another field goal, this time after the exchange of a few passes with forward Kulwinder Singh. Undeterred by an unbeatable 0-3 lead, the Delhi boys continued their spirited fight. Their efforts bore fruit in the 59th minute when skipper Bikas Toppo, the only Adivasi on view in the final, scored following a concerted move involving Danesh Mustafa and Parmod Kumar. Though the Delhi boys could not go beyond that, they had every reason to be elated at their silver-medal performance. Meanwhile, two goals by Inderjit Chadha, a Chandigarh boy, for the IOC was the highlight of the bronze-medal game which saw skipper Deepak Thakur and discarded Olympian Prabhjot Singh working in tandem against the Namdharis. Prabhjot scored in the 19th and 30th minutes to give the IOC a comfortable 2-0 lead before Bachiter Singh reduced the margin for the Namdharis to raise false hopes of his team staging a comeback. One goal each by Inderjit and Bharat Chikara, and a brace by fullback Bikramjit Singh put the issue beyond the Namdharis’ grasp by stretching the lead to 6-1. A goal by Gurpreet Singh was all the Namdharis could do before Inderjit completed the tally for the oilmen. Karandeep, driving a Maruti Baleno, clocked 2.01 minutes, four seconds behind joint leaders Gaurav Singh Gill of Team JK Tyre and Arjun Balu of Team MRF, both clocked 1.57 minutes, in the event being conducted by the Motorsports Association of India. While Gill was driving the 2000cc Mitsubishi Cedia, Balu was behind the wheel of the 1600 cc Ford Fiesta. Lying in third place is Team MRF’s Lohit Urs (1.58 minutes), while Vikram Mathais of Team JK finished fifth (2.04 minutes). While Karandeep is in contention for the national title, leading the points tally with 32, one ahead of Gill (31), Lohit Urs and Balu’s good showing here will strengthen Team MRF’s chances for the team championship title. With Naren missing this round, Team JK will now have to rely on Sunny Sidhu and Vikram Mathias to deliver the goods. While Sidhu is in fifth position in the points tally (13), Mathias is way down the ladder with only two points in his kitty. In comparison, Urs is in fourth spot with 16 points and Balu occupies the sixth position with nine points. The best performances of two drivers will be taken into consideration while deciding the team championship title. In the 1400 cc category, current leader Girijashankar Joshy came up with another good showing, finishing in 2.06 minutes, six seconds ahead of nearest rival Sanjay Agarwal (2.12). Joshy is leading the points tally with 32, while Agarwal is second with 26. In the Gypsy Cup, Suresh Raina was the fastest (2.08), followed by Sanket Shanbhag (2.11). Action now shifts to the Kumarhatti hills in Himachal Pradesh where six stages will be run tomorrow, three over the 9.79 km Lohadi special stage and three over the 12.19 km Kangar Ghat special stage. On Sunday, three stages will be run over the 15.75 km Fagla special stage. Provisional results: Overall category: Gaurav Singh Gill/Farooq Ahmed (Team JK Tyre, Mitsubishi Cedia) 1.57 mins; Arjun Balu/Kumar Ramaswamy (Team MRF, Ford Fiesta) 1.57; Lohit Urs/Moosa Sherief (Team MRF, Baleno) 1.58; Karandeep Singh/Jaidas Menon (Team MRF, Baleno); 2.01; Vikram Mathias/Nikhil Pai (Team JK Tyre, Baleno) 2.04. 1400 cc: Girijashankar Joshy/Srikanth G.N. (Maruti Esteem) 2.06; Sanjay Agarwal/Pradeep Kumar (Maruti Esteem) 2.12; Abhilash P G/Sunil Shetty 2.17. Gypsy Cup: Suresh Raina/Surender Kumar 2.08; Sanket Shanbhag/Ramesh 2.11; Khushwant Randhawa/Amandeep 2.11. Rally Star Cup: Amanpreet Ahluwalia/Manoj Shadija 2.11; Nibu Sayed/Noufel Sayed 2.12; Anil Wadia/Anmol Rampal 2.15. A host of other issues related to the game and the Pakistan Cricket Board's letter asking for an investigation into the conduct of umpire Darell Hair would also be discussed during the two-day meeting which began today. The world body and the BCCI have been at loggerheads over the MPA, with the BCCI saying that signing the pact would adversely affect its commercial interests as well as those of the Indian players. All the ICC member countries are required to sign the MPA to be eligible for participation in ICC events from 2007 to 2015. During the two days of meeting, the Oval Test between England and Pakistan, which saw the first forfeiture in Test history, would be one of the prominent topics in the agenda. The Board will discuss the events surrounding the match, which resulted in the game being awarded to England when Pakistan was deemed to have refused to play. The Board, which meets three times a year, will also receive a report from ICC President Percy Sonn following the fact-finding visit to Zimbabwe undertaken by him and Chief Executive Malcolm Speed. It will also consider Pakistan Cricket Board's application to lift the life ban on pace bowler Ata-ur-Rahman imposed in 2000. The Board will receive a presentation from the ICC Global Cricket Academy's director of coaching Rodney Marsh. The GCA is expected to open in early 2008. "I am devastated just thinking I will miss the World Cup. It is a tournament I have been looking forward to playing in throughout my career. If nothing else I am hoping the ban could be reduced," Asif told PTI today. The 23-year-old bowler said he would lodge an appeal against the ban for the doping offence within the stipulated seven-day period given by Pakistan Cricket Board's inquiry tribunal. The appeal would be heard by a higher tribunal, although it is not clear who would appoint the commission and whether it would include the same members who were on the panel headed by barrister Shahid Hamid, which pronounced the verdict. "The ban has come as a big shock to me and my family. Everyone has been very supportive but for me at this time of my career it is a big let down. I have no option but to make an appeal and hope it is successful," Asif said. The bowler, who had made a big impact with 28 wickets in his last four Tests, denied that he had ever taken any performance-enhancing drugs in his career. "I feel I am bowling at my best at this time of my career and to not to be able to play for one year would be a big disappointment. More importantly I don't want the stigma of being a dope offender attached to my name," Asif said. "I had no idea my trainer knew that what I was taking was illegal. Those things might have been contaminated," he argued. Fellow fast bowler Shoaib Akhtar, who has been slapped a two-year ban for the same offence, has also indicated that he will appeal against the verdict. Asif and Shoaib were recalled from the Champions Trophy in India last month after testing positive for nandrolone in tests conducted by the board before the team left for the tournament. The tests were conducted in a World anti-doping agency-approved laboratory in Malaysia and the tribunal, during its probe, found they were done as prescribed by WADA regulations. Asif said he had consulted his family and legal advisors on the appeal and would repeat his stance before the higher tribunal that he never took any banned substances. Clarke said the condition here were quite different from what the team faced in Mohali during the previous two games, including the semi final against New Zealand. “Conditions here are a lot different from what we faced in the last two games against India and New Zealand. The wickets obviously are a lot slower. But it looks great, a fast outfield. So we need to adapt,” he said. The 25-year-old batsman also said the wicket was looking better at the moment but the team would have to wait for two more days to know its exact nature. “I don’t know about the wicket. It looks fantastic today. Another two days under the sun. Hopefully, it will pull up all right. We can only deal with the conditions once we are out there. We don't know what it is going to be like,” he said. “We know it is going to be slow. But we don’t know if it is going to play better if we bat first or second. We just have to wait and see how it pulls up on game day and go from there,” he said after the team’s practise session. The pitch was described as sub-standard after New Zealand had upset South Africa in their opening match and the ICC’s Chief Curator Andy Atkinson used PVA glue to fix it. The New South Welshman said having played the West Indies at the same venue earlier in the tournament would be a great help to the world champions to stake their maiden claim on the title. “Obviously, playing here against the West Indies has helped,” Clarke said. Australia lost their opening match of the tournament against the Caribbeans and would be looking to avenge the defeat by winning the trophy for the first time. “All boys trained hard today. We are training again tomorrow and look forward to the game. “They (West Indies) played fantastic cricket in the first game of the tournament. They have players like Brian Lara and Chris Gayle and several newcomers who are playing well. They are playing well as a team and we could not chase the runs down. Australia defeated UAE 2-0 in the other match of the group to enter the last eight stage, After being on the defensive for most part of the first half, Thailand took the game into the Chinese territory, but the sudden goal by Wang in the 77th minute took both the initiative and the match away from the Thais at the Salt Lake Stadium here. Wang, playing short passes with teammates to dodge a couple of Thai defenders, took a powerful long range shot which curved into the goal beating Bootprom. BANGALORE: Five-time winners Iraq and Saudi Arabia stormed into the quarterfinals with easy wins in their last league matches in the Bangalore leg of the AFC Asian Youth Football Championship here today. Iraq, who took time to settle down, thrashed Malaysia 3-0 after putting up a patchy performance in the first half that went goalless, while Saudi Arabia dominated throughout to blank Vietnam 2-0, in two Group D matches. Iraq topped the group with better goal difference, followed by Saudi Arabia, while Vietnam and Malaysia made the exit. In the quarterfinals to be played on November six, Japan would clash with twice title winners Saudi Arabia and North Korea would cross swords with Iraq. The other two quarterfinals would be held in Kolkata. Mercurial Mansor Mohammed struck the first goal for Iraq. Aqeel Hameed, who tormented the rivals in the company of Mansor, scored the second goal in the 81st minute and substitute Ala Khshen provided the cushion, scoring the third goal two minutes later. Chetan, ranked 30th in the world, lost to world number six Chen Hong of China 16-21, 15-21 while Kanetkar (ranked 86) was also no match to world number 19 Sairul Amar Ayob, losing 9-21, 11-21 to the Malaysian to end Indian challenge in the $170000 five star tournament. Chetan had earlier beaten Erwin Kehlhoffner of France and Peter Mikkelsen of Denmark en-route to the pre-quarters while Kanetkar had run past Roman Spitko of Germany and world number 29 Kasper Oedum of Denmark. Among other Indians, Anup Shridhar had lost to Dicky Palyama of the Netherlands 9-21, 15-21 in the second round while P Kashyap and Anand Pawar were beaten by Sairul Amar in the first and second rounds, respectively. Aditi Mutatkar, the lone Indian entry in the women's singles, got a bye in the first round but lost to world number seven Lu Lan of China 13-21, 14-21 in the second round, according to information here today. Jeev fired a seven-under 65 following his bogeyfree six-under 66 on first day to lead by one shot at midway stage despite a last hole bogey. It put him on road to his first Japan Tour title and that comes in the week after his winning the Volvo Masters of Europe in Valderrama. Jeev has won titles on Asian and European tour but none in Japan. The Indian had eagles on 10th, his first hole of the day, and 17th, the second last. He birdied four in a row from 14th to 17th and added one more on third. His bogeys came on fourth and ninth. He now has three eagles in two rounds. Tetsuji Hiratsula is second at 12-under with 67 and 65, while Korea's Ike j-Chang, the joint first round leader is third at 11-under. As many as eight teams have confirmed their participation. The teams are BSF Jalandhar, JCT Academy, PSEB Hoshiarpur, RCF Kapurthala, City Club, Phagwara, Sikh National FC, Banga, FC Rurka Kalan, and Olympian Jarnail Singh Memorial Football Club, Garhshankar. The winners will be awarded a cash prize of Rs 51,000 and the runners-up Rs 31,000. Special prizes will also be awarded to outstanding players, according to former international Kashmira Singh, chairman of Phagwara Football Academy. The North Zone Inter-Varsity tournament is in progress at Muslim University, Aligarh. Both the selectors have been asked to report at Aligarh. In the league match played today, YPS, Mohali, registered a 2-0 win against Daly College, Indore. Miljot and Karan Singh scored 1 goal each for the winners. In the second match of the day, YPS, Patiala defeated St. Soldier Divine Public School, Panchkula, 6-0. Ripudaman scored 5 goals and Sukhraj scored 1 goal. Pinegrove defeated APS, Dagshai, 3-0. Avkaran scored 2 goals and Salil scored 1.